Finding uses for something that I’d normally throw out is fantastic. This video is the perfect one for me to boost my trash saving ways. It’s all about keeping the part of the orange that you’d normally pitch and using it in some fascinating ways. I already knew about a few of these. In fact, a few years ago right before Christmas a wind and ice storm knocked out our power. I still had a lot to do for the next day, and it was super cold in the house. A friend, who lived about a mile away still had power and invited me to come over until the electricity was restored. I agreed that it was a good idea but asked if I could bring my grapefruit and oranges to peel and make then next day’s citrus salad. To make a long story short, I had a huge bag of orange and grapefruit peels that I threw in her trash bin outside. She told me later she loved it. Rather than smelling the used cat litter when she opened the lid, she got a whiff of citrusy-good fragrance. 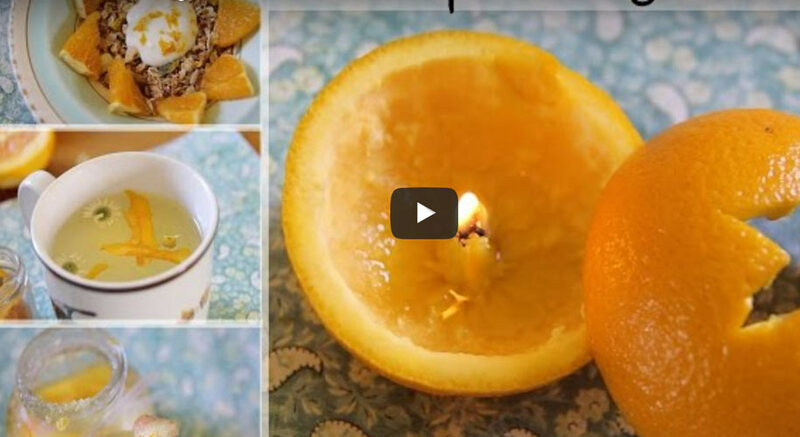 The video suggested potpourri as one use but had one that I never heard of before and loved. Wait until you see the candle idea.